If Jonjo O’Neil was disappointed to be absent from The Festival today, at home suffering from flu, he had the perfect pick-me-up when Black Jack Ketchum scooted home in the Brit Insurance Novices’ Hurdle. “It’s such a shame that the person most responsible can’t be here, but this’ll cheer him up,” said Derrick Smith, husband of the owner Gay. Their children Zara, Dwayne and Paul completed the family representation as they were presented with the winner’s trophy by the Princess Royal. Derrick Smith admitted that the family did not have too many doubts during the race. “This is what we expected and there wasn’t really wasn’t any moment when we were worried. Everything went to plan. “To be honest I would have been cheering the winner up the hill if it hadn’t been our horse as it was such a good performance,” said Smith, adding that future plans for the horse now had to embrace Aintree and Punchestown. “We could go anywhere now;” he said. Smith’s smile would have been broad enough without an investment on the horse, but the former trader for Ladbrokes admitted that he did have “ a small wager” on his wife’s horse. The winning jockey on the even-money favourite, Tony McCoy, went to the head of the Racing Post Festival Jockey’s Championship, with the success being his third of The Festival this year. McCoy recalled “The first day I won on him at Uttoxeter he won a very average race but I said to Carl Llewellyn, ‘this is a machine!’. He’s got a great attitude and never gets bothered. “I was in front a little bit early but he travelled and jumped well and I knew if I got him over onto the running rail that would keep his mind on the job. 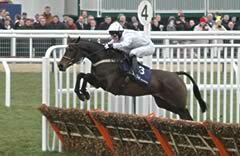 Powerstation and Travino filled second and third place respectively in the Brit Insurance Novices’ Hurdle behind impressive winner Black Jack Ketchum. The second had already seen the back end of Black Jack Ketchum when chasing that horse home at The Open meeting at Cheltenham in November. A delighted Charles Byrnes said afterwards: “He’s come here after a break and has run very well. “He’s run right up to his November running with Black Jack Ketchum and I would be keen to take the winner on if he goes to Aintree, as I think he would get an 8lb penalty there. Back in third was Travino, who thrilled his trainer Mags Mullins. Ms Mullins said: “I am delighted with that run. “He’s a chaser in the making. He travelled over well and he will going home in great shape with a good run under his belt. “It’s also good that he now has some experience of Cheltenham and hopefully we will back next year for something like the Royal & SunAlliance Chase.